Jace K. asks: Did anyone ever figure out how old Kim Gwang-suk really was in the 92 Olympics? On one remarkable day in September 1991, North Korean gymnast Kim Gwang-suk accomplished what few have been able to do – score a perfect 10 on the uneven bars. Her days of glory were numbered, however, as her small stature and apparent physical immaturity spurred an age falsification scandal that eventually saw North Korea being barred from certain competitions for a time. Prior to 1981, gymnasts as young as 14 could participate in the elite competitions, although, prior to Nadia Comaneci’s dazzling performances in 1976 at age 14, most gymnasts were far older – even competing into their 30s. But after Comaneci scored seven (yes, seven) perfect 10s in the 1976 Olympics, trainers, coaches and athletes alike began to realize the benefits of having younger females compete. Having a distinct advantage in terms of both agility and being significantly more limber, these younger female athletes displayed a far greater ability to jump, flip, leap and fly across the equipment when compared with their older counterparts. As such, during the 1970s there was a sharp increase in the number of young teens participating in gymnastics competitions. Seeing this trend, some medical professionals became increasingly concerned about the effects of such strenuous training and competition on a still developing body. (Indeed, gymnastics, along with ice hockey, are the two sports with the highest incidences of “catastrophic injuries in both male and female participants” according to the Research Institute at Nationwide Children’s Hospital.) Ultimately, whether it was the competitive advantage or health concerns, officials chose to raise the minimum competition age in 1981 to 15 (and later in 1997 to 16). So, in 1992 when Kim showed up to the Barcelona Olympics claiming to be 17 years old, some couldn’t help but notice that her short stature (she was less than 4.5 feet / 1.4 meters tall), slender build (she weighed only 62 pounds) and the fact that she was missing her front teeth, could indicate that she was not as old as claimed. As for those teeth, Kim’s coach’s explanation was that she lost them during a training mishap. This was accepted by officials and she was allowed to compete. But for an errant step on her dismount from the bars, Kim likely would have won gold at the 1992 Olympics, but instead she placed third. However, even after that competition, many still speculated the North Korean Gymnastics Federation was lying about Kim’s age and an investigation ensued. It soon revealed that Kim’s team had listed her at 15 years old for each year 1989, 1990 and 1991, but then suddenly raised it to 17 in 1992. Fed up, the International Federation of Gymnastics banned the entire North Korean team from the 1993 World Championships. So what was Kim’s true age at this time? This has never been publicly revealed. 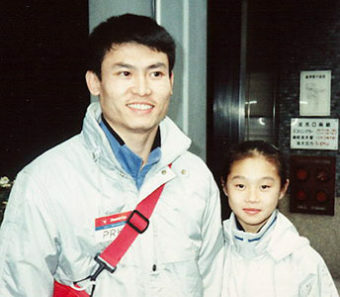 Given that as late as 1992 her birth date was still being changed from competition to competition by the North Korean Gymnastics Federation, it would seem safe to assume she was not the required minimum of 15 years old, lest they presumably would have just started using her real birth date at that point. Some, such as famed coach Béla Károlyi, speculated that she was only 10 years old in the 1992 Olympics. Supporters of her being this age point out the missing two front teeth as evidence. However, girls usually precede boys in losing their baby teeth and the front most teeth on top and bottom are typically the first to go, generally around the age of 6 or 7. While an age of 10 for the loss of such teeth would not be totally unheard of, there is other, much more concrete, evidence that she could not have been 10 years old in 1992. This comes in the form of video footage of her competing as far back as 1987. If she was 10 in 1992, that would make her about 5 in that video. But the extreme skill level shown there, not to mention that she doesn’t look like a 5 year old in the footage, would seem to indicate she must have been at least a couple years older, if not more. Thus, if we assume she was around 7-9 in that video, that would put her at around 12-14 in 1992. While, again, it wouldn’t be impossible for a 12-14 year old to be losing their front baby teeth, this would be even more unlikely than if she was 10, perhaps indicating that her coach really was telling the truth that she simply lost those teeth in a training accident. So to sum up, while Kim’s true age has never been revealed, it would seem likely given they were still fudging her age randomly leading up to the 1992 Olympics that she was not 15 at that time, and that more likely she was probably somewhere in the range of 12-14 years old. Opponents of the minimum age requirement in gymnastics point out that barring these younger girls from competing at the highest levels does nothing to protect their bodies in reality as they still train and compete in junior competitions just as much, and are even scored using the same Code of Points. So barring them from competing in the Olympics and the like simply robs the world of seeing some of these girls when they are at their peak performance levels, rather than actually protecting their bodies from potential long term physical issues. If you’re wondering why male gymnastics doesn’t seem to have the same age scandals that surround female gymnastics, this is because men’s gymnastic events tend to require a lot more upper body strength than women’s, making the strength of slightly older males more of an advantage compared to the loss of some flexibility and the like that comes with age. From 1990 to 2005, approximately 425,000 kids between 6 and 17 years were treated for some type of gymnastics-related injury that was sufficiently severe that it required an ER visit. Computing to about 26,000 injuries each year, the vast majority were suffered by female athletes (82%), and the average age of the patients was 11.5 years. In order of frequency, the most common injures were to upper extremities (42%), then lower extremities (34%), then head/neck (13%) and finally to the torso (10%). Boy gymnasts were more likely to injure their head and necks, while girls were more likely to have suffered an upper extremity injury. In addition, younger gymnasts (6-11 years) were more likely to hurt their arms, hands & wrists, while older gymnasts (12-17) were more likely to strain or sprain their legs and ankles. How Old Was Kim Gwang Suk? Why Is There an Age Limit for Gymnasts in the Olympics?